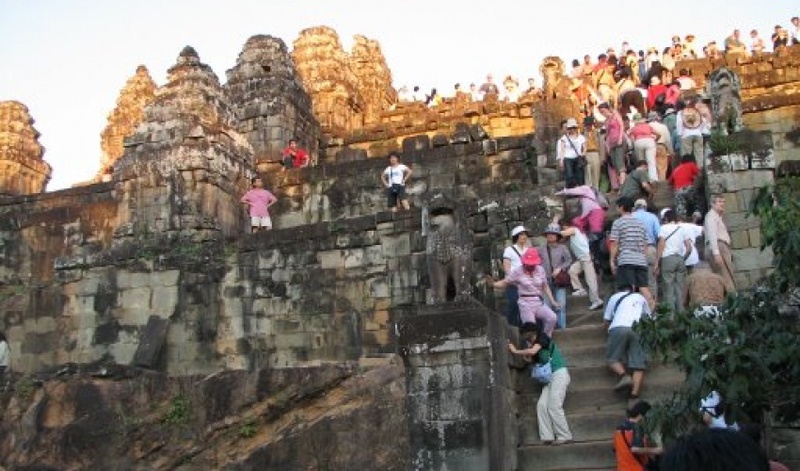 Phnom Bakhen at Angkor, Cambodia, is a Hindu temple in the form of a temple mountain. 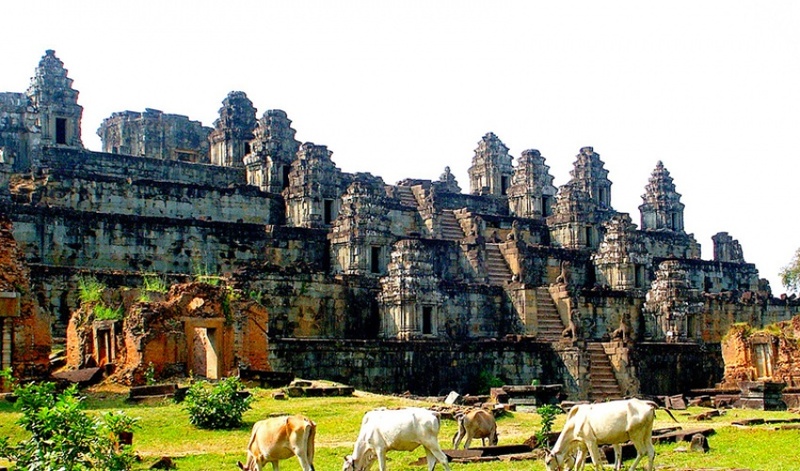 Dedicated to Shiva, it was built at the end of the 9th century, during the reign of King Yasovarman (889-910). 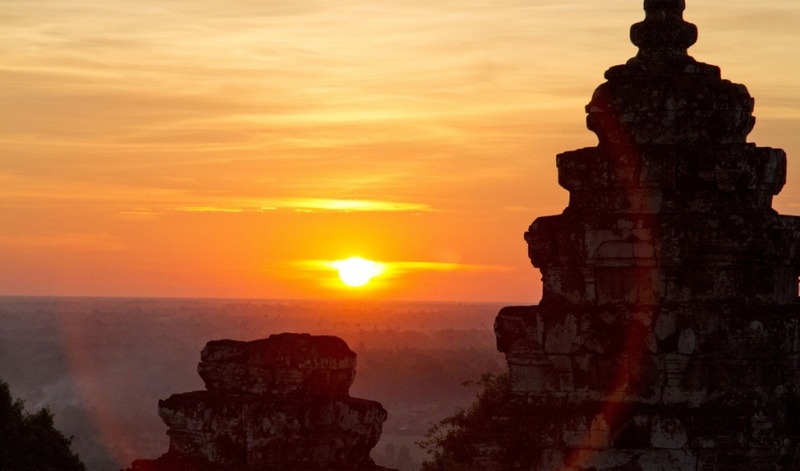 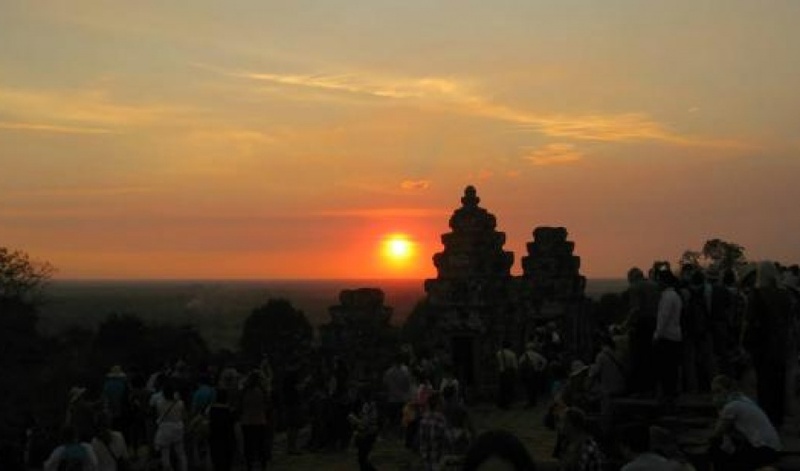 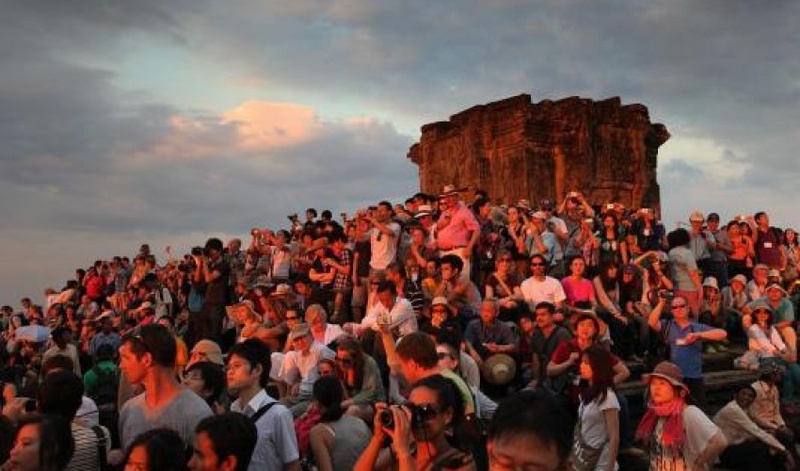 Located atop a hill, it is nowadays a popular tourist spot for sunset views of the much bigger temple Angkor Wat, which lies amid the jungle about 1.5 km to the southeast. 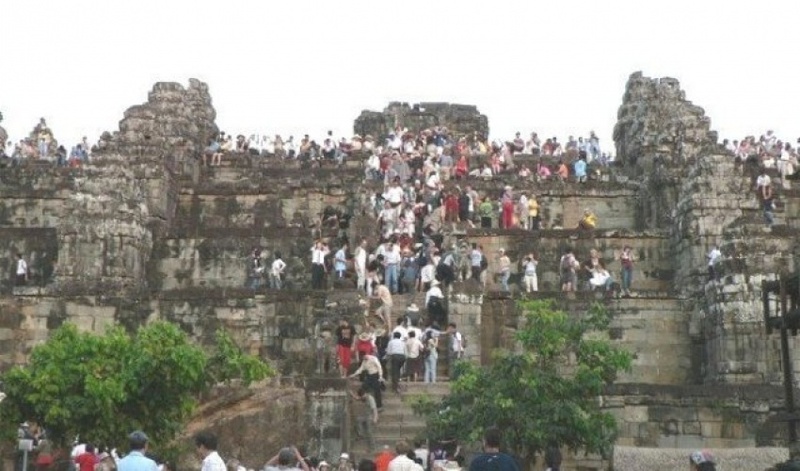 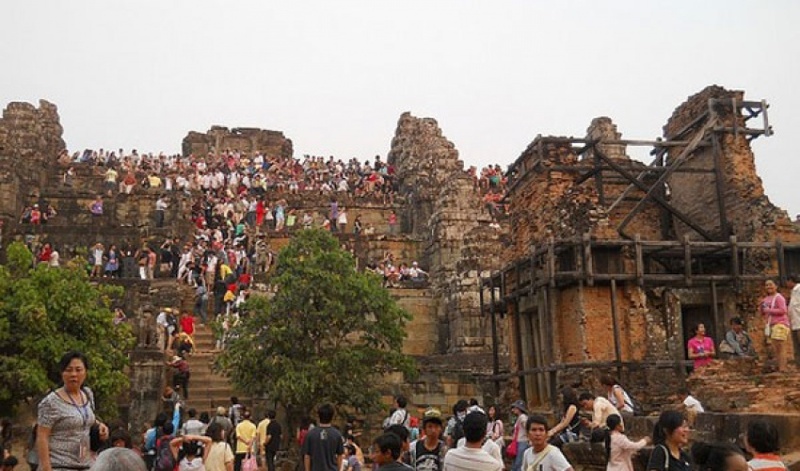 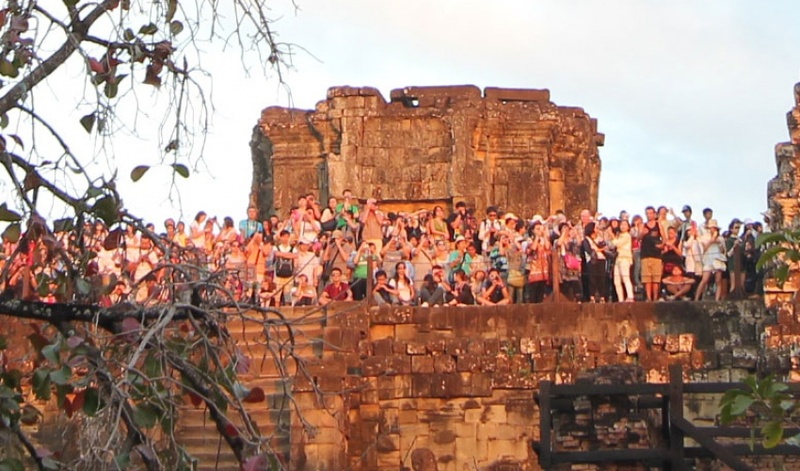 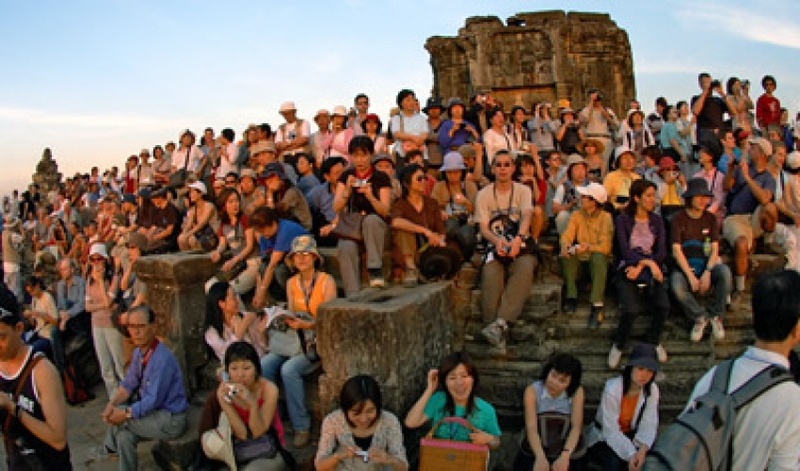 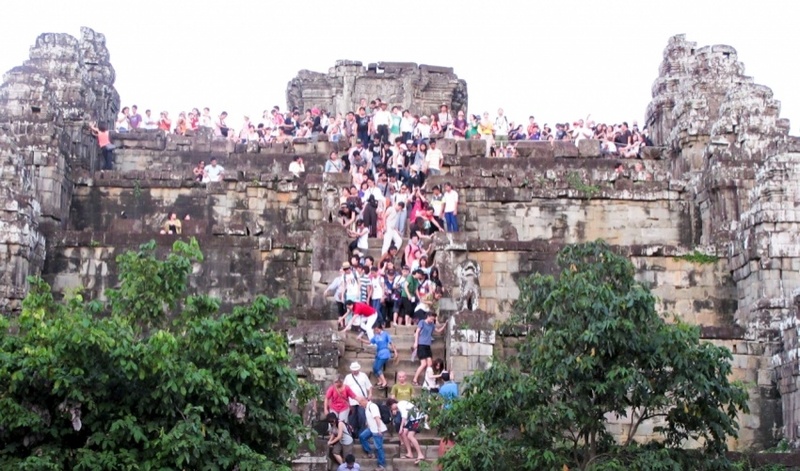 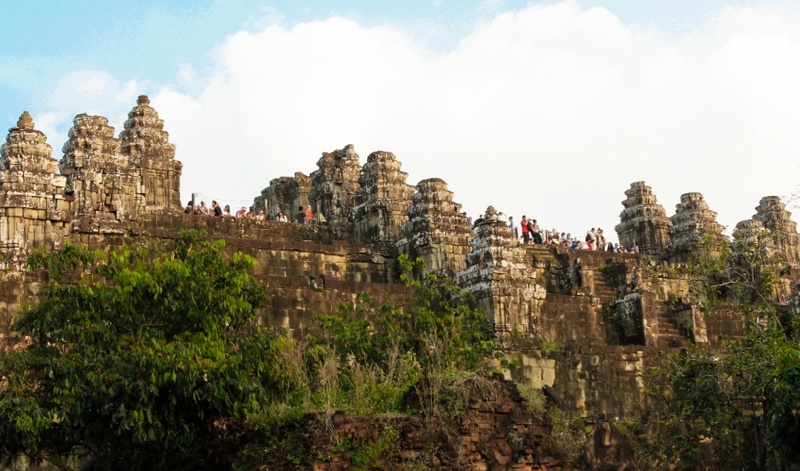 The large number of visitors makes Phnom Bakheng one of the most threatened monuments of Angkor. 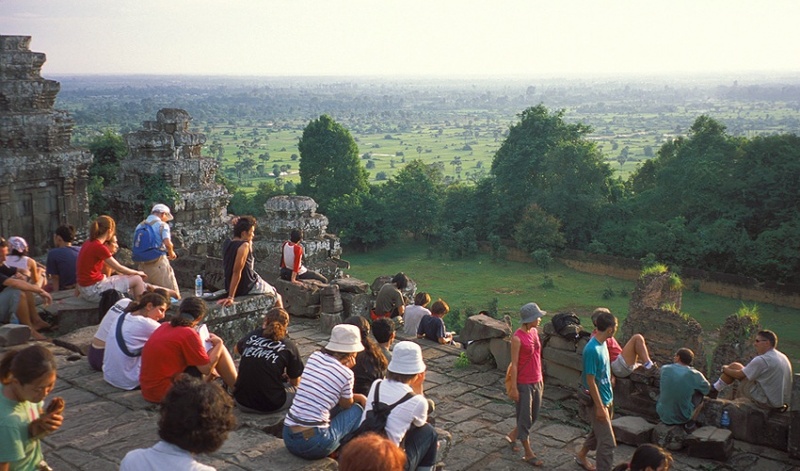 An inscription dated 1052 AD. 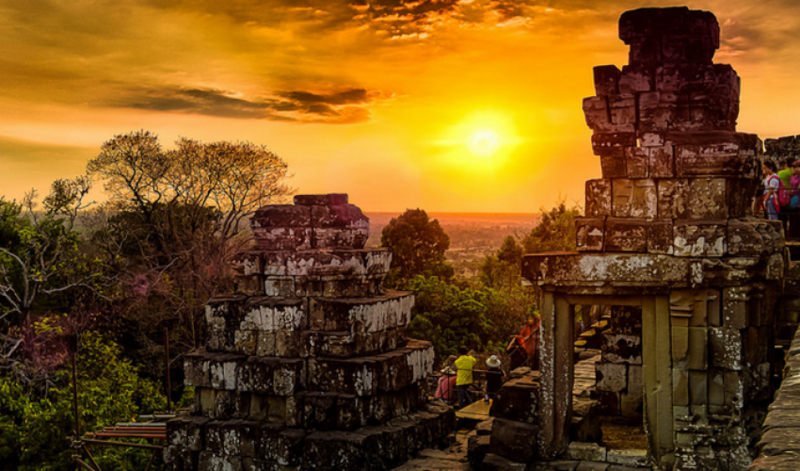 and found at the Sdok Kak Thom temple in present-day Thailand states in Sanskrit: "When Sri Yasovardhana became king under the name of Yasovarman, the able Vamasiva continued as his guru. 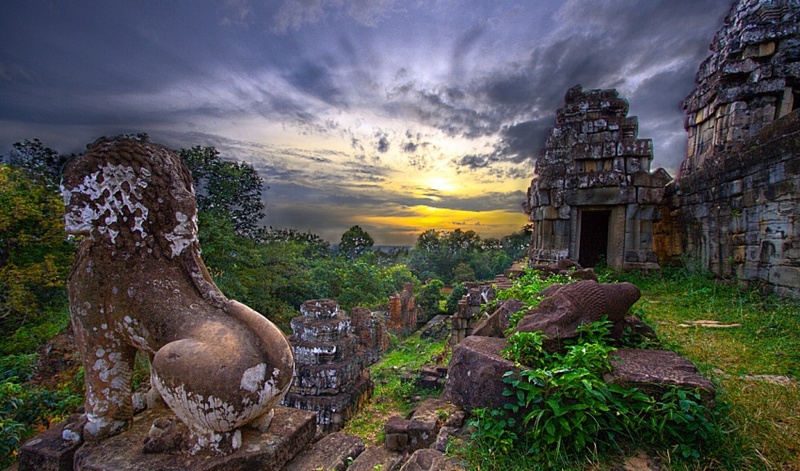 By the king's order, he set up a linga on Sri Yasodharagiri, a mountain equal in beauty to the king of mountains." 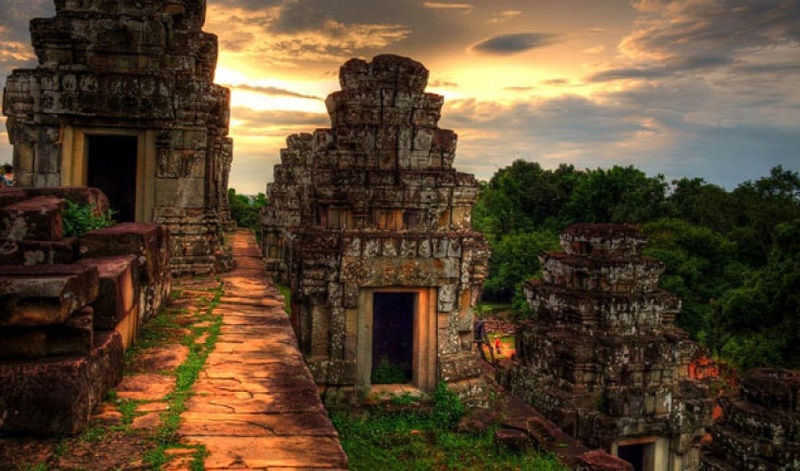 Scholars believe that this passage refers to the consecration of the Phnom Bakheng temple approximately a century and a half earlier. 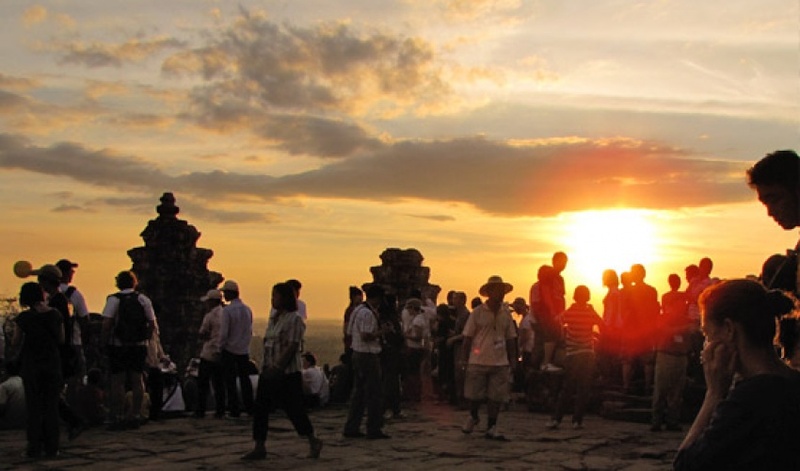 Phnom Bakheng is a symbolic representation of Mount Meru, home of the Hindu gods, a status emphasized by the temple’s location atop a steep hill. 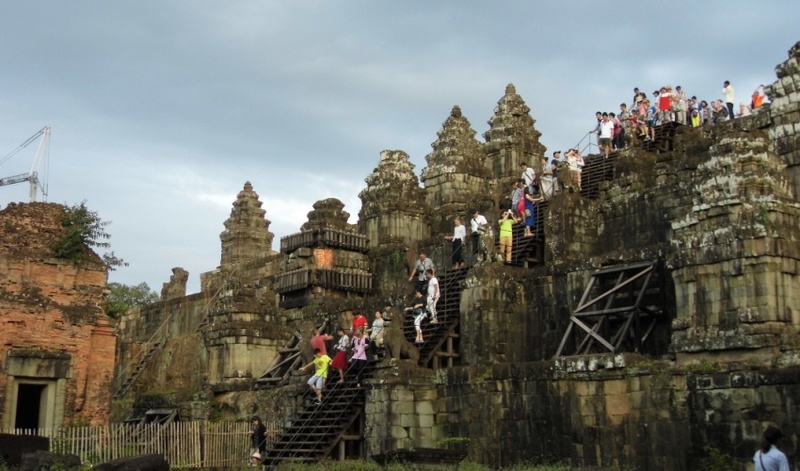 The temple faces east, measures 76 meters square at its base and is built in a pyramid form of 5 tiers. 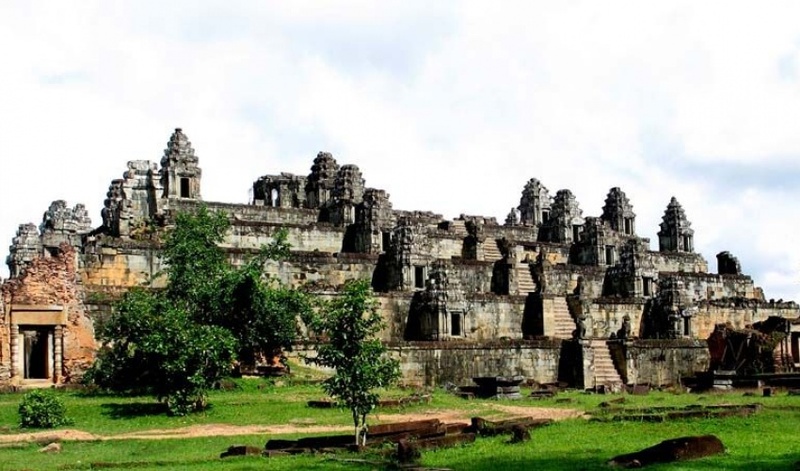 At the top level, five sandstone sanctuaries, in various states of repair, stand in a quincunx pattern one in the center and one at each corner of the level’s square. 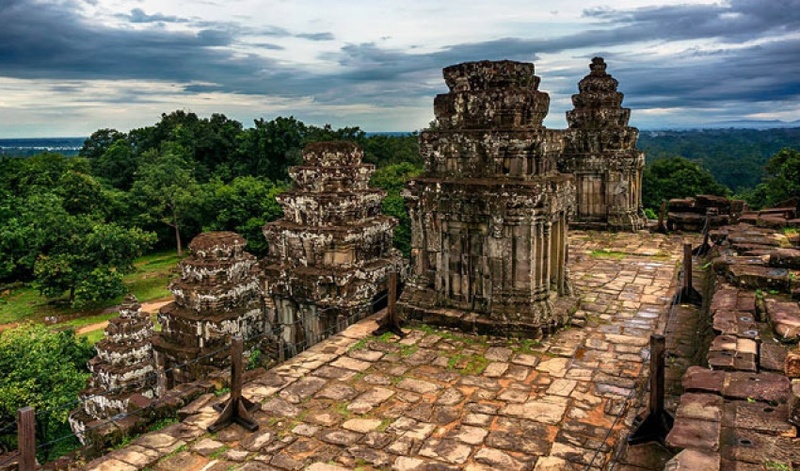 Originally, 108 small towers were arrayed around the temple at ground level and on various of its tiers; most of them have collapsed.